There will be 2 fixed tracks used by the Nerdsynth itself.Track 1: Our very own Nerdsynth Soundchip (which will be feature rich and very cool!! Draw your own waveforms on the touchscreen, crazy wavetables etc…a work in progress)Track 6: Sample track. Here you can play (multiple) samples, change their pitch, add FX, just as you know it from mod-trackers. Perfect for drums and voices….or maybe a special sampled instrument. The aim is to have most probably 4 ‘sub’-tracks here. It will also be possible to create advanced rhythm patterns here, not just 4 by 4.Track 2..5: User Tracks. Here you can assign 4 Soundchip Modules ( we call them NSA … Nerdsynth Sound Adapter ) to the 4 tracks. Those modules will be ‘adapters’ to old and new soundchips. Soundchips we want to support are SID6581/8580, YM/AY, ATMegatron, Pokey, Speakjet/Soundgin, OPL-3, Analogue sound modules, CV/Gate out and some more. There will be a list of soundchips we want to support and a progressbar to show their state. Those NSA’s will be in the form of Cartridges as you know them from old consoles/homecomputers. You insert 4 of them in the Nerdsynth and it will recognize which Soundchip is installed on which Track and enables its specific features in the Tracker. 6 freely assignable (via effect commands or global) Rotary encoders. Cool while playing live! BUT: There will be more to the VGA output. Instead of cloning the display output to the monitor a 7th track can be used to ‘track’ some Video stuff->Make your own visuals!! Think of a tracker like interface, but instead of inserting Notes and Effects you insert commands like ‘draw line from coordinate A to coordinate B’… and many more commands and graphic effects. Tracked graphics! Simple usability without triple or quadruple functions per button. 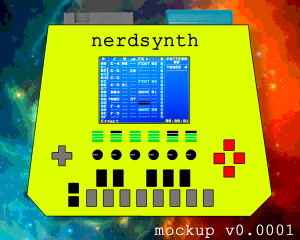 This is a mockup and the Nerdsynth will most probably look and feel different in the end! We plan to produce the Nerdsynth but that will take at least 1 or 2 more years until it is ready for that. Now we will concentrate on implementing and testing the basic features and hopefully all our hardware ideas will also work as expected in the new prototype. Until then, check out the mockup and stay tuned for new information.